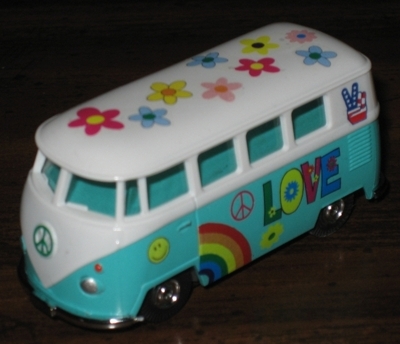 These decals have been designed specifically to fit the DASH VW Bus. 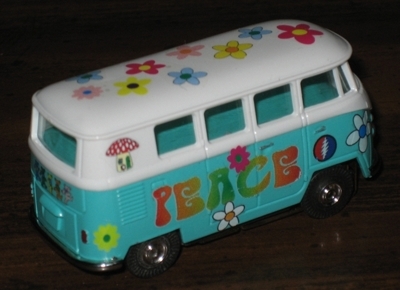 They will also fit the T-jet VW Bug, Dune Buggy, or any other car that needs a little "Flower Power"! Note: patchouli oil is NOT included! Hide the granola!! 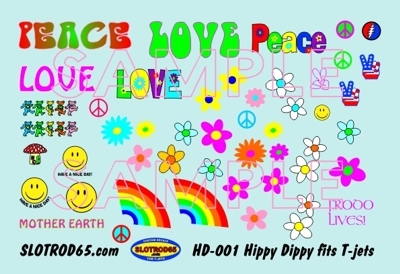 This decal from slotrod65.com features a classic hippy symbols and logos in bright colors to make them 'pop-out' no matter what the body color. Use them on hoods, trunks, roofs or even car doors! Note that the actual decals are far sharper than the sample scan.